I'd like to make some changes to the board in the near future and your input is critical. What kind of changes do you think should be made? What do you think we could add that would improve the site? We could even do nominations and votes on background image ideas or maybe it's possible to have 2 or 3 which the forum will randomly rotate through every time a page is loaded? Last edited by BostonUrbEx; 02-12-2011 at 07:27 AM. I think the biggest issue for this site is the main page and I think it should play to the forum's greatest strength: photography. I think archBoston.com could easily be the premiere Boston-based urban photo site. Just setting up something simple like a tumblr on the front page would bring tons of visitors to the site. You could leave submission open and whoever uploads whatever and just selectively edit from there. Another option would be to select photos from the Photo of the Day thread. Edit: As far as the forum goes, it's fine the way it is. All I want are a strike out tag and a spoiler tag. I like the idea of the main page being a blog that different members contribute to but it won't work if it's not updated. The [strike][/strike] tags are built into vB. They must have been disabled or something happened along the way. I agree that we should capitalize on our member's supreme photo-taking capabilities. We also need a refreshed logo, non-default skin, and a vibrant, engaging landing page for those that find us through Google and other sources. Also, for our front page, we should maybe put a news section on it (put under the "Enter the ArchBoston forum, another avatar that says "Enter ArchBoston news"). At first we'd mostly be linking to stories from the media, but I'm sure we can write some stories ourselves, contributing our unique perspectives. That would greatly increase our profile in Boston-area media and "buzz"
I like the idea of having more for the main-page, but I really like how minimalistic, classy, and modern feel to it as is. Right under the current logo/banner, some really short quick links like "News and Blogs" and "Upcoming Events" would be nice. Nothing flashy or eye catching, just a lite directory. I think a "What would you do" section, or recurring thread would be alot of fun and spur some creative juices. I am sure everyone has taken a look around said to themselves.. "heres what I'd do if I had the opportunity". Say the topic is .. Downtown Crossing or Pier 4 or the East Boston Waterfront. Have folks propose their own ideas for a new development site or planning and redeveloping and existing area and post em. Challenge each other, discuss and design (maybe including renderings, site plans and such). Basically, instead of reacting to proposals and critiquing developments after the fact, get proactive and come up with some original creative ideas. Purely for example for one possibility. I've always felt like the site could be a real portal for development and real estate news for the greater Boston area. Basically like Curbed, but for Boston. That, however, would take a team of dedicated developers and an actual plan on how to pay for it. The obvious downside to that would be that the forum aspect of the site would take a back seat, so I can see how it wouldn't be the most popular idea. Also, I like Suffolk's idea about having a blog on the front page. I'd certainly want to contribute to that. 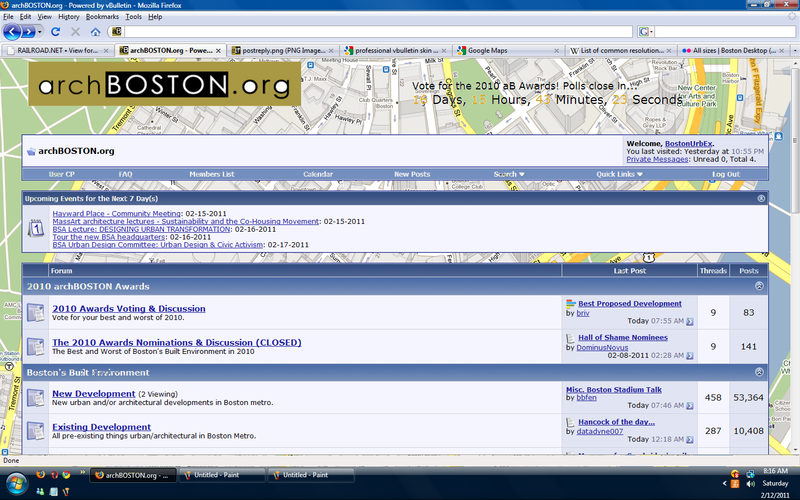 I think, basically, if there are any major changes to the site they need to either enhance the forum or compliment it. I'd also like to see a section of building info only by building that can be used a reference, location, height, type, start date, completion date, the works. Yeah we can really take the site to a whole new level, let's get it started! I can design the layout of the new sites, seems like BostonUrbEx can make the themes, icons, and background, have some of our good writers write some articles (Mr Keith, Joe_Schmoe, many others), set up photo galleries for our good photographers (probably can't be hosted on aB itself though), and i guess each member can have their own personal blog to write articles before they are promoted to "official" aB writer. This is a very easy setting to fix, but will result in even longer page loading times. I personally think they should be even smaller. The web development standard for forums is 640 x 480. If you like what you see, you can click on the bar and view the fullsize photo. Some page load times on this site are HORRENDOUS, such as the Photo of the Day ones.